Eddie Russ was an important figure to emerge from the vibrant underground jazz scene that thrived in Detroit in the early 1970s, existing in the cultural and economic desolation of the city after the departure of Motown in the late 1960s. This scene included the musical collective Tribe (including members Wendell Harrison, Marcus Belgrave, Phil Ranelin, Harold McKinney and Doug Hammond) and Kenny Cox’s Strata Records. 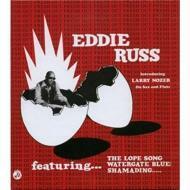 Eddie Russ’s Fresh Out was first released in 1974 on the independent Jazz Masters record label.